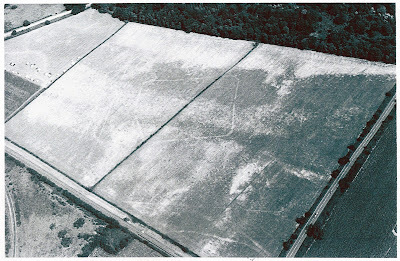 This aerial photograph, kindly provided by Robert Smith of the Sherwood Archaeological Society, shows the “crop marks” in the ground, visible at times of dry weather outlined in the crops (which grow differently over buried and otherwise invisible remains of walls/foundations or ditches). It is possible that this obvious rectangular shape could be the outline of a Roman fort. The view is looking NNE across the site, which is in the fields between Whinbush Lane (lower left corner), Beanford Lane (top left – the ford is in the trees just off the photo 1/4 of the way across from the left of the top edge) and Oxton Road (across the bottom right corner).